Most individual will have episodes of back pain at some stage of their life, it can arise gradually or as a result of an accident , fall etc. Lower back pain can be debilitating and severely life limiting. We deal with back pain all the time and even with severe diagnosis including bulging and damaged disk , we can achieve very good results. Treating back pain is a multi part process and one of the most important part is for the client to adopt new exercise and activity patterns, workplace changes and postural attention. Recent research shows that these are the 3rd most common orthopaedic injury occurring in the general population. There will have been an event where the client has gone over on the ankle to either side followed by pain discolouration and swelling which usually subsided after a few days with the appropriate RICE treatments. 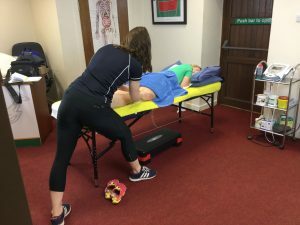 To fully recover from such an injury it is important for the client to engage in a process of rehabilitation to restore proprioception, movement and strength in the lower leg. 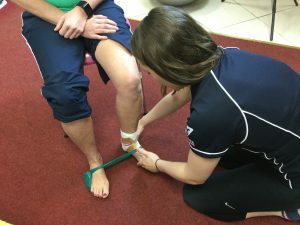 Failure to do this can result in repeated sprains and further irreparable damage to the ankle which can affect sport participation and general mobility. Out therapist are expert at treating and rehabilitating sprained ankles to ensure you’re full recovery from this type of issue. 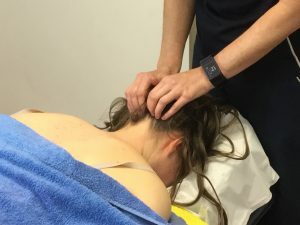 Treating Whiplash with Myofascial Techniques at Hartnett Physical Therapy, Ballinrobe. Fibromyalgia is a condition which affects the muscles and soft tissue. Symptoms include chronic muscle pain, fatigue, sleep problems and painful tender points or trigger points. Medical treatment attempt to alleviate the symptoms as opposed to finding a cure. At the clinic we will assist in reducing the pain from painful trigger points which are a major symptom of the condition. We will also advise and plan out exercise routines which over time ill greatly alleviate the effects of the condition. Proper physical therapy in conjunction with your doctor’s advice and medication will provide the best outcome to an individual with fibromyalgia. Very common in sports people they can also affect the general population. In sports people they could be associated with training changed and overload or poo flexibility. They can also occur in the general population from activities such as gardening or poor posture and bad seating. We will treat your injury comprehensively based on uncovering and remedying the root cause of the strain.